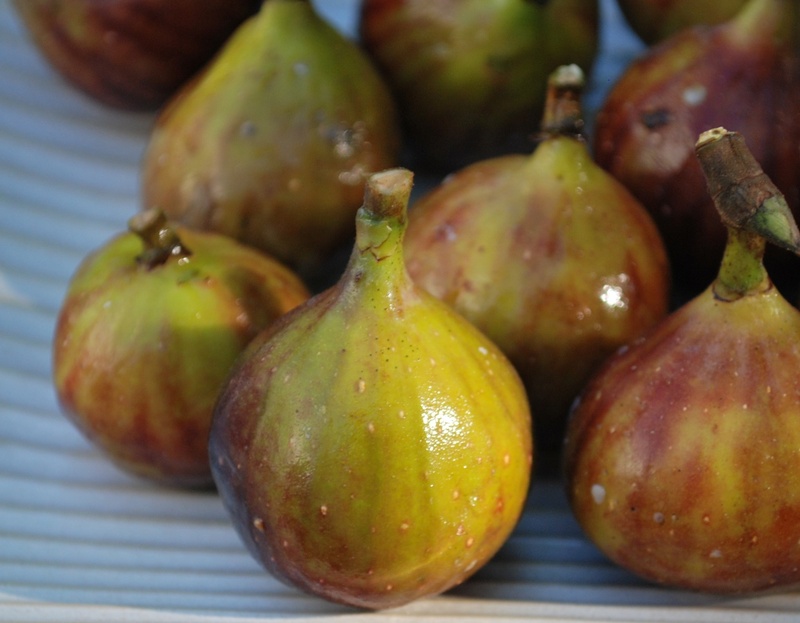 Those of you who have followed this blog since the beginning may remember how much I love figs. They were the subject of my very first post. While it wasn’t anywhere near fig season when I wrote that original post, we’re right smack in the middle of it now. I pass by a laden fig tree every morning when I’m out walking the dog and have to fight the urge to pick a fig or two as I go by. So when a friend of mine emailed me last week to ask if I’d like some figs from her tree, I responded with an enthusiastic yes (and probably a “Yippee!” in my head). She delivered them a few days later on her way to work. I was touched by the fact that she had even thought of me for the figs (instead of not thinking of me at all or instead of offering something I don’t love, like zucchini, for instance). Perhaps she remembered me talking about how much I like them? Whatever the reason, I am grateful she thought of me and even took the time to deliver them to my house. I had fun photographing them in the morning light, but it was hard to resist eating them before I was done snapping pictures. My mom always shared what she grew in the garden – including zucchini (which my brother and I wish she had shared all of instead of keeping any for us. Oh, the zucchini trauma stories we could tell). She made the most beautiful bouquets of flowers to take to people and would even send bouquets of gardenias in to work with me because she knew I loved them so much. She doesn’t garden as much as she used to, but the flowers still bloom and create a beautiful space surrounding my parents’ house, and I like to think of her garden as a gift to her neighbors. She has rubbed off on me that way. I try to plant flowers each year that will give me enough to share with others. And I save more random glass jars than most people, so that I can always have a “vase” handy. However, there are still seasons of the gardening year that I haven’t quite figured out, and I hate those times when I want to bring someone flowers and head outside to find that nothing terribly pretty is blooming. 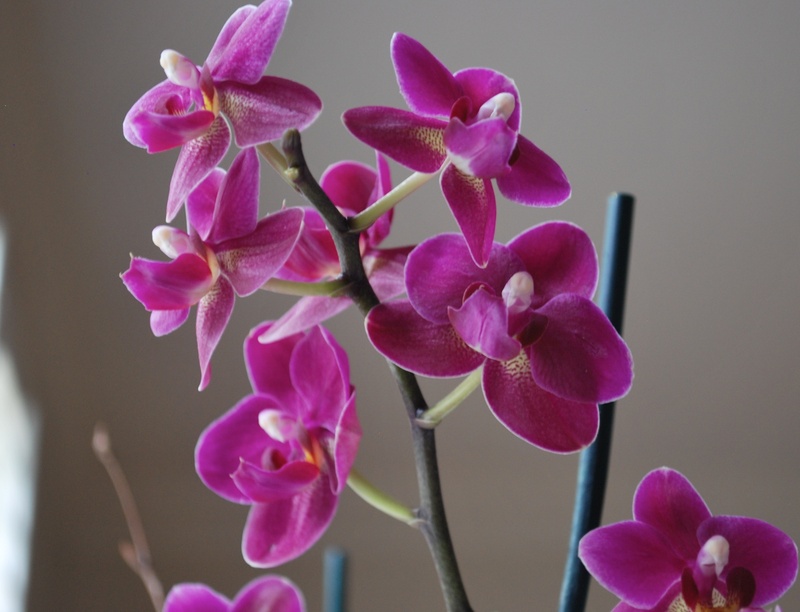 She knows I struggle with orchids (I do much better with outdoor plants that have a better chance of surviving my bouts of neglect), but she promised these are easy to care for. I really do hope I can keep the plant alive and blooming. 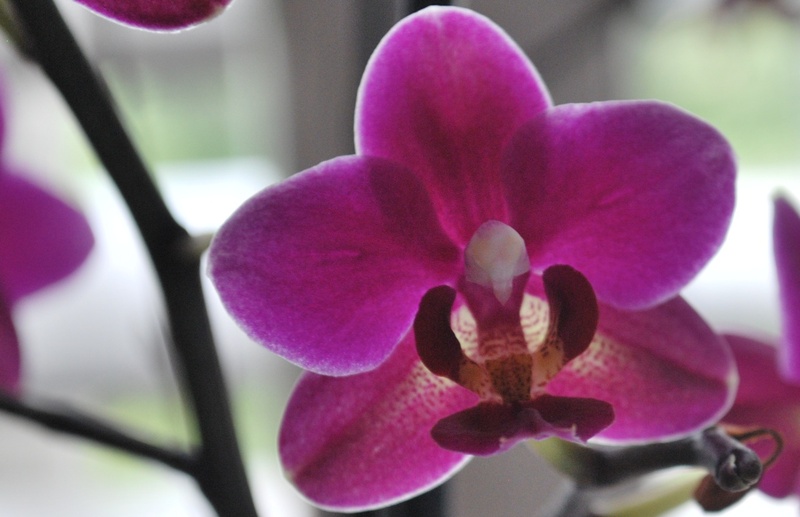 I love the way the afternoon light filters through the orchid’s petals. For those of you who garden, do you share what you grow? Do others share with you? Do you think it strengthens friendships to offer homegrown gifts or even store-bought gifts of fruit or flowers? For those of you who don’t garden, I’d love to hear what simple gifts you share with your friends. What ways do you share the crop of kindness and abundance from your own life with others? Oh, and to my friends who live nearby (you know who you are), it’s baby lacebark elm tree season at my house. Let me know if you’d like one of the elms for your own yard. They’re a gift I’d love to share with you. This entry was posted in flourishing tree and tagged figs, friendship, gardeners, gardening, gifts, gratitude, kindness, lacebark elm tree, orchids, sharing, trees, zucchini by hopesquires. Bookmark the permalink. This reminds me of my Daddy sharing the vegetables and flowers he grew. My brother and I wanted him to share all of the green beans. Barbara — your green beans comment makes me laugh. I think Mom grew snow peas and green beans, but I don’t remember minding those as much as the zucchini, though snapping the beans was more work. Thanks for sharing your memory and for making me laugh. This was the first year we attempted a fruit and vegetable garden. My husband and sons planted and cared for it. I had visions of an abundant harvest and fantasies of sharing the food with our local food bank. As it turned out, we had a modest yet exciting harvest. I love cooking with food fresh from the garden. The zuchini comments made me chuckle. I actually wanted to include zuchini in our garden this year but the boys couldn’t find any seeds the day they looked. Mike thought maybe it didn’t grow well in the soil here. I would love some tips from your mom for next year. I think the tons of rain we had here made for an interesting summer for home gardening. I’m glad you had some success and bet next year will bring even more of a harvest as you learn what works well in your garden space. On the zucchini front, I’d caution you to plant just a few seeds and then just keep one of the shoots. Zucchini season was traumatic for us growing up because even one vine could produce an unimaginable number of zucchinis. We had zucchini every way imaginable, including cut up in salads disguised as cucumber (my nightmare because I loved cucumbers so well and especially despised raw zucchini). We had it sautéed a lot. My mom did make good zucchini bread, but that was really the only way I liked it. I still have trouble eating it, though I know it’s good for me. I look forward to hearing how your garden grows next summer!